You can get there from here-you just need to start from where your students are. In this lesson, introduce your students to the world of maps and discover a world of information online. Read below to see how your students can explore the world of maps through printed representations and online versions available through the EDSITEment-reviewed National Geographic Society Xpeditions website. The steps of this lesson are carefully scaffolded to help young children make the shift to viewing the world around them in a two-dimensional format. Students begin by depicting the familiar terrain of their favorite rooms. In order to understand the concept of boundaries, they then create maps of areas within their classroom. To reinforce the relationship of small to large and the concept of one area nesting within another, students then compare a series of online geographical maps, beginning with a map of their home state and ending with a map of the world. Finally, students may extend what they have learned by creating maps of other parts of their immediate environments-e.g., routes that they regularly travel. Note: A shorter version of the lesson could be conducted by skipping Steps 4-5 ("Mapping the World" and "Mapping the Past") and introducing these concepts at a later date. What are maps and how are they used? What are the purposes of different kinds of maps? What can maps tell us about our environments? The first step of this lesson requires that students have access to a variety of maps: e.g., museum maps, park maps, subway maps, bus maps, road maps, as well as geographical and political maps from atlases or encyclopedias. You will need to collect as many maps as possible before you teach the lesson. You may also want to show them maps from familiar children's stories, such as Peter Pan and Winnie-the-Pooh. Activity 1. What is a map? Explore what students already know about maps. What is a map? Why do people use maps? What does a map contain that makes it a special kind of "picture"? What kinds of information are included on maps? What kinds are left out? What types of maps have students seen and/or used? Divide the class into groups of 3-5 students each, and give each group a set of maps to examine. These may include museum maps, park maps, subway maps, bus maps, road maps, or maps from familiar children's stories (e.g., Peter Pan or Winnie-the-Pooh), as well as geographical and political maps from atlases or encyclopedias. If your supply is limited, try rotating the maps from one group to another in order to let each group view as many different types as possible. What kinds of things can you see in this "picture"? What makes this map similar to another you've looked at? How could you use this map? Activity 2. Make "mental maps"
Having gained some initial impressions about maps and their purposes, students will now explore what maps can tell us about our immediate environments by studying a "mental map" from the EDSITEment-reviewed National Geographic Society Xpeditions website. You may share this map with students at individual computer stations; by assigning small groups to share a number of computers; by means of a computer-projected image displayed to the whole class; or by printing out the image and distributing copies of it to students. Click on to see how a child might mentally map a familiar room-in this case, the kitchen. Prompt students to take note of the details this "child's-eye view" includes: e.g., the refrigerator, the cereal, the cookies, the dinner table, and the child's family. Why might the child who drew this map have chosen to include these details? Now have students make "mental maps" of their favorite rooms in their own homes. As students work on their maps, circulate among them and ask them what kinds of details they think are important to include. Remember that the accuracy of their maps is less important than each student's experience of externalizing, in map form, a mental image of a space that is important to him or her. When the maps are complete, have each student present his or her map to another student, describing each element of the map and explaining why it is an important part of his or her environment. Divide the class into groups of four students each. Give each group a large piece of poster paper, a ruler or yardstick, a pencil, an eraser, and a set of colored pencils or markers. Tell them that they are now going to create maps of their classroom. Explain that one of the groups will make a map of the entire classroom, while the other groups will make maps of smaller areas within the room. Before students begin, discuss what kinds of details they might or might not need to include on each type of map. The students who are mapping the entire room might simply draw a square or rectangle to represent each piece of furniture, for example, while the students who are drawing the area maps might include subtler details, such as important objects that are on the furniture. Help each group to determine the area on which their map should focus. After the maps are complete, have each group present their map to the rest of the class, noting the information they chose to include. As each map is presented, discuss its boundaries: What are the limits of the classroom? Where does each area of the classroom begin and end? Are certain areas of the classroom designated for specific purposes only? An understanding of boundaries will help to prepare students for Step 4 of the lesson, in which they will need to recognize the borders of their state, nation, and continent in order to see how one geographical area "nests" within another. Finally, post the maps on a wall or bulletin board, grouping the area maps together to form a large map of the entire room. Again, the accuracy of the map is less important than the students' perception that many small maps can be put together to form one big map. Students will now compare a series of geographical maps, which can be obtained through Xpeditions. Click on and then select "Atlas" to access a world map. Note: Although the maps on the website move from "big" (the world) to "small" (individual states), you will present them to your students in reverse order, moving from "small" to "big." Again, you may share these maps with students at individual computer stations; by assigning small groups to share a number of computers; by means of a computer-projected image displayed to the whole class; or by printing out the images and distributing copies of them to students. First, show students a map of their home state, which can be accessed by selecting "North America" at the top of the page, then selecting "United States" from the menu running down the left-hand side of the page, and finally selecting the name of your state from the menu running down the left-hand side of the United States map page. Ask students if they recognize any of the names of cities noted on the map, and have them try to locate the city closest to where they live. Then show students a map of the United States. Clicking on "United States" at the top of the page will return you to this map. Ask students how this map is different from the previous map. What can they see on this map that they couldn't see on the previous one? What can't they see on this map (e.g., the names of cities)? Can they find the location of their home state? Next, show students a map of North America. Clicking on "North America" at the top of the page will return you to this map. Again, ask students how this map is different from the previous maps. What can they see on this map that they couldn't see on the others? What can't they see (e.g., subtle details such as small rivers and lakes)? Can they find their home state on this map? Why or why not? Finally, show students a world map. Clicking on "World" at the top of the page will return you to this map. Once again, ask students how this map is similar to or different from the previous maps. What kind of information does this map include? What kind of information does it leave out? If they wanted to find their own location on this map, where would they look? Finally, you may show students a selection of historical maps to give them an idea of how people long ago drew their maps and to allow them to see how the process of making maps has changed over time. The "Christopher Columbus Chart" provides an example of how mapmakers conceived of the world 500 years ago. 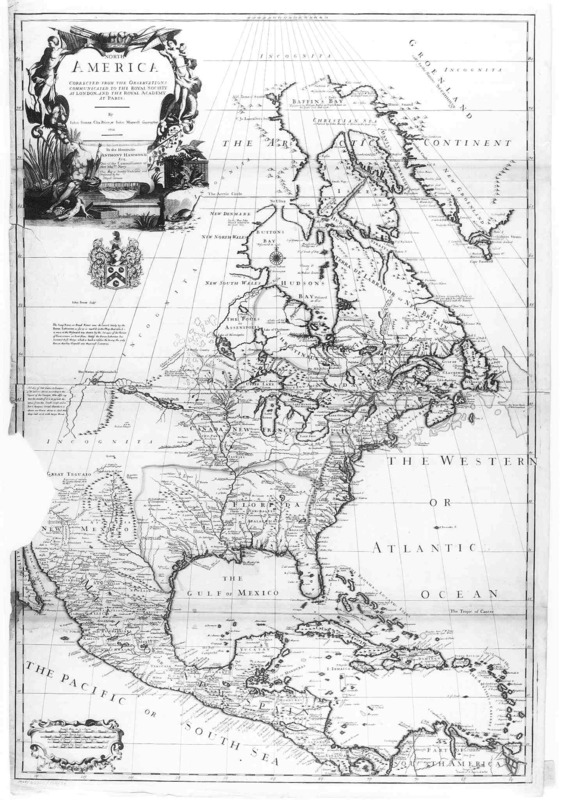 The "Senex Map of North America" offers a late 18th-century view of the North American continent. Ask students why today's maps might be different from those of long ago. What advantages do contemporary mapmakers have that mapmakers in the past did not? To conclude the lesson, ask students to recall the various types of maps they have viewed and created, from large, geographical maps of the world and its nations to small maps of the students' classroom and home environments. What can maps can tell us about where we live-and where we don't live? How can maps be useful to us in our everyday lives? Return to the Xpeditions website and have students view another "mental map" -- a child's drawing of his route to school. Click to view the map. Then have students create their own maps of routes they travel regularly. Younger students might draw maps of the route from their classroom to the gym, the library or the cafeteria, for example, while older students might draw maps of their routes to school.